Women, if I've done my math right, were giving birth for at least a few generations before the advent of modern medicine, for all its comforting smiling doctors with expensive degrees in shiny new hospitals. So it makes you wonder what all the itemized, billable fuss is about, when this is something midwives took care of simply and practically for centuries before men decided to stick their noses in. 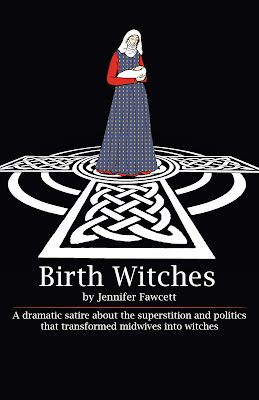 Jennifer Fawcett's satire Birth Witches examines this question by bringing us back to the early 17th century, a very fascinating time in England's history, and pitting a Doctor (Tim Budd) who has invented a new tool for extracting a baby against young Meg (Dorothy Jolly), who wants to be a midwife just like her dear old grandmother (Jody Hovland). Fawcett's script is very insightful, with a lot of humor and humanity to balance out its moments of heartbreak and horror. Riverside's production, directed by Leda Hoffmann, does the piece justice. It is well-cast, well-directed, and well-designed; the versatility of the set (by Paul Sannerud) and the Chorus allow the company the flexibility to straddle the line between outrageous lampoon and thoughtful, character-driven exploration. We start right with the gritty but necessary business of the play's subject matter: a childbirth, this one gone wrong. Lots of screaming, bloody sheets, general panic. Midwives are trying to soothe a woman in great pain. We find out that her husband, a Doctor, has been testing his new apparatus, a sort of primitive forceps: "when it still wouldn't come," one of the women reports, "he used the hook." The mother dies; the baby is alive but horribly scarred. The father, a scientist at heart, will improve his device but in the meantime he needs a scapegoat... and wasn't the old midwife seen mumbling a curse before the mother started having pains? Flash forward to 1606. James I has recently ascended to the throne and united, for the first time, England and Scotland under one crown. The transition, however, is not without tension: the worlds of rural Scotland and urban London do not mix quite so easily in practice. The Old Midwife reminds her grandaughter Meg that the hustle and bustle of the Royal Exchange and the hypocrisy preached at the Anglican church are both distractions from the true ways of healing: "the spirits of the earth were here before there were streets. If you want to be a healer, Meg, you must listen to the spirits of the land beyond the city and its church bells." Meg is on board, but she is naive, too eager and innocent, not saavy enough about the social and political forces that will soon undo her. She is truly a lovable character, and Jolly's charm and creativity endears her to the audience. She has a cure for everything, not so much magic as simple know-how — what herbs will cure what and how to prepare them — and she can't help but share. She wants to ease everybody's suffering, all at once. But, though she's well aware of what's going on in the continent, she's brave enough to push on, knowing the English would have to mad to go around burning midwives based on silly superstitions. Meanwhile, our Doctor arrives in town, with his scarred son, Peter (Luke Brooks). He is tireless; he finds the right ears to bend to get the midwives out and the male doctors in. He overcomes resistance doggedly, using logic and superstition interchangeably and appealing to people's greed and pride. He keeps working on his "tool" all the while. Budd does a great job with this complex character; it's clear that he's aware of the damage he does, and it's clear he cares, but it's also evident that he has a greater drive -- to honor the memory of his wife, to advanced the cause of science, to learn more about the body for the betterment of all. He has a blind spot, however, for his son, who wants to be like him but is too ugly. The scenes between Budd and Brooks are excellent; they come together well on some heartbreaking material. The Doctor's quest brings him into conflict with Meg, who has not only befriended his son but is helping his niece, the Baroness (Haley Karlson) deliver her child. It quickly becomes clear that "scientific progress" cannot take place without violently destroying what came before. By the end of the play, when women everywhere are being arrested for "magic" and ratting out their neighbors, helping out with the cycle of life can become a death sentence. The final scenes are tragic and tearjerking, performed beautifully by Hovland, Budd, Jolly, and Brooks. Birth Witches isn't all high drama and hopeless heroism, though. The use of a Greek-style chorus to poke fun at some of the "science" going on in 17th-century England add a good deal of humor to the piece. The "Chorus of Fine Gentlemen for the Advancement of Science" consists of a bunch of smart guys in robes with fancy hats who know a lot better than women what this whole childbirth thing is all about. They know, for example, that the miracle of birth is simply a matter of a man planting a tiny homonculus in the woman, a fully-developed man-child that will grow until it is big enough to come out. The idea of using a tool instead of one's hands is a question of propriety, apparently: "a woman's hoo-hah," the Chorus Leader (Jaclyn June Johnson), reminds us, "is a most sacred place." So the Doctor advises, in one of his impromptu lessons, to "keep your eyes at a modest level and thrust the tool in." The comic exaggeration only makes the process more shocking: they're not even looking at what they're doing? No wonder both mother and child are being scarred! 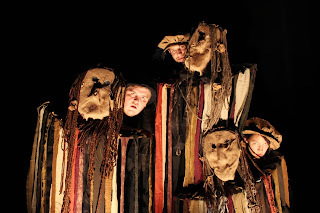 The Chorus does a great job of moving the play along, helping it shift in tone as comic exaggeration becomes hysteria, and simple folly and superstition become fear and persecution. Hoffman's skill in directing these scenes is evident, and the early Chorus scenes are as hilarious as the later ones are chilling. Johnson's acting is fantastic as the Chorus leader, from her first stint as intelligent doctor with excellent elocution to a brash and manic James I. We see James, childlike and ridiculous, applaud like mad as the witches of Macbeth cast their spell; this same manic energy turns dark at the end, when she condemns Meg for her attempts to heal suffering. The rest of the chorus becomes slowly more ominous throughout the piece as well, as they start off as bumbling doctors with over-the-top affectations and end up as lurking spies, seeing witches in every corner of the piece. Using the chorus in this way is an excellent analogy for what mob mentality does to society, as what starts as harmless fun becomes downright frightening. Birth Witches is Riverside's tenth collaboration with Cornell College, and most of the chorus (in addition to Jolly and Brooks) are college students. These young actors do a wonderful job with this piece, bringing lots of life and energy to every scene. The show plays on a beautiful and versatile stage designed by Paul Sannerud. A simple web of intertwined pathways resembling a celtic knot, it allows the use of levels while keeping sightlines very open, and it solved the problem of staging the birth scenes quite well. Women can recline and still be seen, and what is once a bed can later be a street. The set is simple and elegant and allows the company a lot of room to play. It's exciting the amount of talent we have right here in Iowa City, and the continuing efforts of theatres like Riverside to produce more new works should be applauded. Birth Witches is a show that uses sharp humor and great storytelling to get at issues that still affect us today. See this show while it's still playing; it's not the kind of thing you get to see every day. 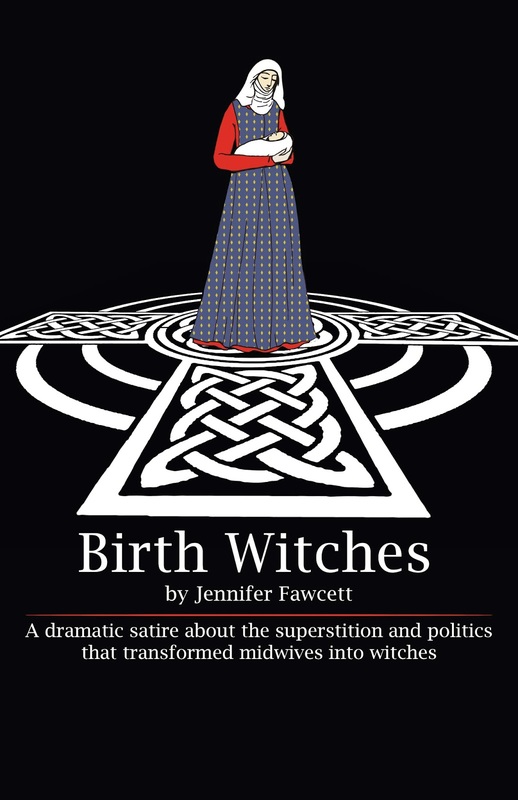 Birth Witches runs through November 3, with 7:30 p.m. shows on Thursdays, Fridays, and Saturdays and 2 p.m. shows on Sundays. Tickets available at the theatre M-F 12-4 p.m. or one hour before each show, or by calling 319-338-7672.